Giveaway | Philly's Best Launches New BBQ Cheesesteak Menu - EAT WITH HOP! I am a cheesesteak lover. Have been ever since my middle school trip to the east coast. I went to Philadelphia and had my first one there ever. It was pure cheesy and meaty bliss. YUM! But I live in the OC and the closest thing to that is probably Philly's Best. It's got the whiz and everythang. 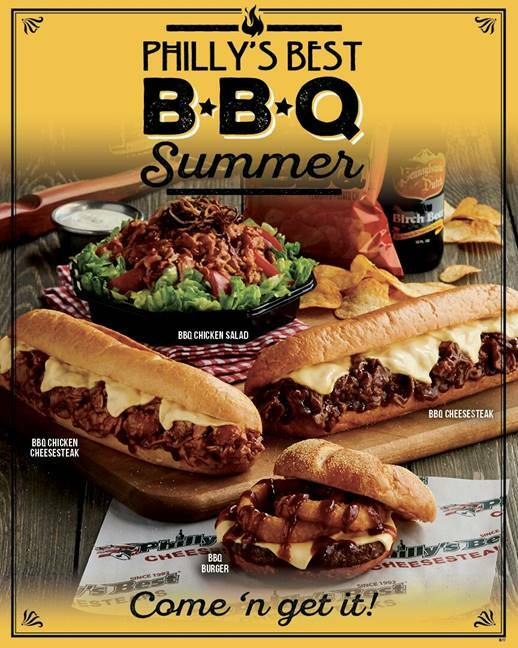 And now, in addition to their classic philly's cheesesteaks, Philly's Best is launching a new menu for the summer featuring BBQ versions of their cheesesteaks! I had lunch here with @ViaFood and we ordered everything from their new menu except for the salad. I guess you can say we are big meat eaters haha. BBQ Burger – juicy all-beef patty topped with white American cheese, crispy golden onion rings and smoky BBQ sauce on an authentic Amoroso Kaiser roll. The BBQ Burger we got was a bit misleading at first. We both honestly thought the staff forgot to add the beef patty. But it turns out, the patty was completely covered with the cheese. Whoa! That's a lot of cheese! There were no greens about it. Just cheese, meat and onion rings and of cousre their BBQ sauce. In my opinion, the Amoroso Kaiser roll buns were a bit dry. Maybe add some more bbq sauce! We also got both the chicken cheesesteak and the regular one, BBQ Version! BBQ Cheesesteak – thinly sliced steak tossed in smoky BBQ sauce with melted white American cheese on an authentic Amoroso roll. Available with or without grilled onions. BBQ Chicken & Cheese – thinly sliced chicken tossed in smoky BBQ sauce with melted white American cheese on an authentic Amoroso roll. Available with or without grilled onions. I tend to enjoy the beef cheesesteaks more than chicken, and that was the same case here too. I loooooove beef! I love how Philly's Best tries to keep it authentic to Philadelphia. I remember going to the Downey location and they even had seating taken out of a ballgame stadium. How cool is that! Anyway, I've tried quite a few places that serve Philly Cheesesteaks and while I can't say that Philly's Best is my absolute favorite one (does the one in Philly count? ), I'd have to admit that they do serve solid cheesesteaks and hoagies with a huge variety on their menu. Out of all the stuff we ordered, the BBQ Burger looked the most disappointing. The poster photo of it looks so delicious with a juicy meat patty! But the actual product seemed underwhelming. So I wouldn't recommend getting the burger. The bbq philly cheesesteak is a `whole nother story though! It's a bit salty though... but aside from that it's pretty good! The saltiness is probably from the intense amount of cheese! It has a juicy meaty taste from the well-seasoned beef and oh so cheesy! I love how they have a condiments bar where I can add more jalapenos, peppers and pickles! Overall, I would recommend the bbq beef cheesesteak! I regret not getting add-ons though, because adding some pepperoni sounds good right now. The new BBQ menu is available through the end of August at all 21 Philly’s Best locations! P.S. I AM HOSTING A GIVEAWAY! I am currently hosting a giveaway on the Eat With Hop! Facebook page which runs till July, 28 (Friday). I am choosing 1 lucky Taste Bud to win TWO VOUCHERS redeemable for a philly cheesesteak! WOO! So y'all can take a friend! How to enter? Simple! Just tag your Taste Buds on this Facebook Post.